As the shortest Interstate in the Harrisburg area, it serves an important function in creating an eastern shore bypass of downtown. Even before a spade full of dirt had been tossed for construction on the Interstate, the 283 designation existed in the same corridor. Signed in 1961, PA 283 was the designation for Eisenhower Boulevard. 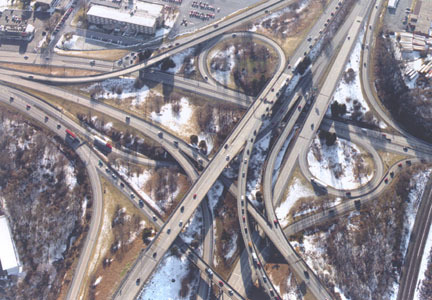 For years, it served as a connection between the Turnpike's Harrisburg East Interchange to where construction had ended on Interstate 83 at the location of the current Eisenhower Interchange. Construction began on the section between Exit 1 and Exit 3 in 1968, which included moving a segment of PA 441. In 1970, the first section opened to traffic from an expanded Harrisburg East Interchange to Exit 2. Also included in this section was the reconfiguring of the exit ramp from the Turnpike into the Exit 1 cloverleaf. It was a precursor to the PA 283 expressway which would get underway the following year. Construction on the Interstate concluded in 1971 when the Eisenhower/Hershey Interchange complex was completed. It is one of the most complex, if not largest, in the Commonwealth with four expressways and three streets intersecting. Upon its completion, it made the cover of the 1972-1973 Department of Transportation map seen at the left. In July 2001, work began on rehabilitating the bridges within the Eisenhower/Hershey Interchange. The $4.7 million project will be conducted in stages over the next four years and includes concrete repair, replacement of expansion joints which are worn and need to be replaced, and updating the guide rail. The project is scheduled to be completed in July 2005. Project website: http://www.penndot8.net/index05-a.htm. Due to the deteriorating condition of the expressway surface, PennDOT decided to repair the surface and repave the entire route beginning in March 2003. Crews used Superpave to resurface the Interstate. Also involved in the project was changing the traffic pattern at the Eisenhower Interchange which occurred in Summer 2003. Overhead signage directed traffic to the left lane for both northbound and southbound I-83 and the right lane for eastbound US 322. After the completion of traffic studies, it was determined that 45% of traffic was headed to northbound I-83, 45% to southbound I-83, and 10% to eastbound US 322. The traffic pattern was changed and new overhead signage installed to direct traffic to the left lane for southbound I-83 and to the right lane for northbound I-83 and eastbound US 322. Page updated March 14, 2010. Information courtesy of the Pennsylvania Department of Transportation and Rand McNally.